Now known as Gulf Coast Maker & Comic Con, the event is Tampa Bay’s biggest and oldest Maker festival, and one of the oldest maker festivals in Florida – a community celebration of the Florida Gulf Coast’s DIY Inventive Spirit since 2012! Eureka Factory partners, Terri & Steve Willingham, hosted Tampa Bay’s first maker festival, Tampa Bay Mini Maker Faire, in 2012, at the University Area Community Development Center. 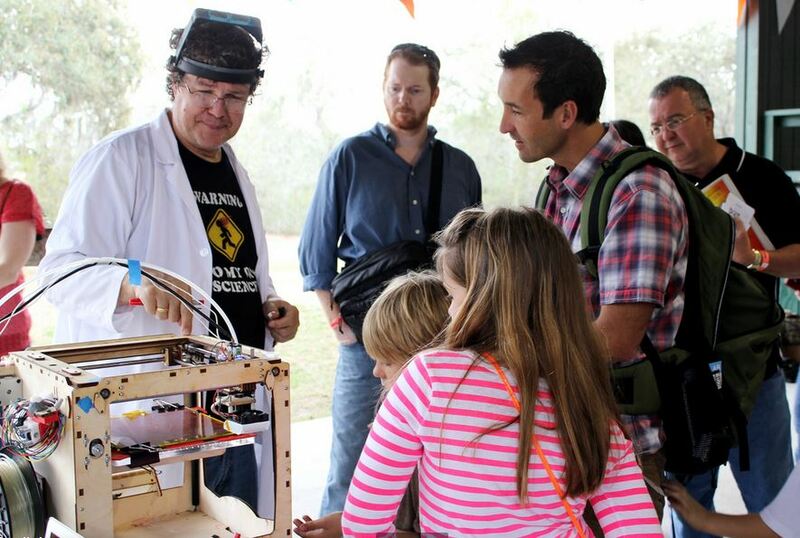 With the success of the 2nd annual event in March 2013, at the Rotary Pavilion in Pasco County, and the Willinghams development of the Hive Community Innovation Center at John F. Germany Library, along with the growth of makerspaces and hackerspaces throughout Tampa Bay, a bigger community celebration was clearly in order. In 2014, the event moved to the Florida State Fairgrounds as Gulf Coast MakerCon , an independent innovators festival put together by a great group of collaborative partners, with an emphasis on technical, creative and professional exhibits, workshops and sessions covering everything from patent development and the inventive process, to 3D printing, programming, mechanical and electrical design, green tech and open source technologies. As an independent maker festival, Gulf Coast MakerCon became free to showcase all kinds of products by all kinds of companies, small businesses and individuals, honestly assess things on their own merits, and openly celebrate in the truest DIY spirit of independent, self-reliant, unfettered creativity and fun! In 2014 and 2015, we received support from Hillsborough County Economic Development and in 2015, received a Proclamation declaring April 18th, 2015″Maker Day” in Hillsborough County! We took at hiatus in 2017, due to a family emergency, but have teamed up with St. Petersburg College Seminole Campus to bring together the venerated Pinellas ComicCon and MakerCon (which had also taken a break in 2017) and Gulf Coast MakerCon into one huge, FREE event now called Gulf Coast Maker & Comic Con. The inaugural mash up event was held March 24, 2018, at the SPC Seminole Campus and drew 3000 people! Gulf Coast Maker & Comic Con provides added value for adult attendees, with a special Young Makers section for kids and families, comic and graphic arts and gaming areas. The event provides a wide variety of creative and interactive vendors, exhibitors, and entertainment that includes everything from robotics and metalsmithing, to recycled instruments, ham radio, automotive tech, gaming, inventions, innovations, future tech and much more. We look forward to continued growth and enjoyment of Gulf Coast Maker& Comic Con for many years to come!